There are a few car lighting projects that the Rapido and FVM lighting kits won't work well on. The first is the Conrail OCS9 with its class and ditch lights. I plan on using a DCC decoder for this. Two other projects are also looking to be difficult. The Bachman Super Dome needs a very low profile lighting kit in the dome and a smaller secondary light on the lower deck. I think the peel and stick "rope light" that I'm using for layout lighting would also work well here. I have been able to remove the protective clear "bead" to create a self stick SMD strip less than 2mm tall. I think this would be perfect for the dome. Since this won't be to be fancy, I figured I'd just use Kato live trucks wired to a bridge rectifier, a few capacitors and a small diode (the strip is rated at 12v but I think it will be too bright so I want to bring it to about half brightness). Looking at bridge rectifiers at Digikey, they are all rated at several hundred volts. Am I right in assuming that voltage doesn't matter as long as you don't go over the amp rating? Correct. The voltage rating should be higher than the highest voltage it will see in your circuit, but the high limit is irrelevant. Same applies to the amperage. If you peek into this thread, we have been discussing car lighting. To quote: A much cheaper alternative would be to pick up an LED strip from eBay then power it up from the track (using my deflicker circuit). Craig is using the circuit I posted in https://www.therailwire.net/forum/index.php?topic=29654.0 . He loves it. That is a lengthy thread - for the schematic and technical stuff start here. 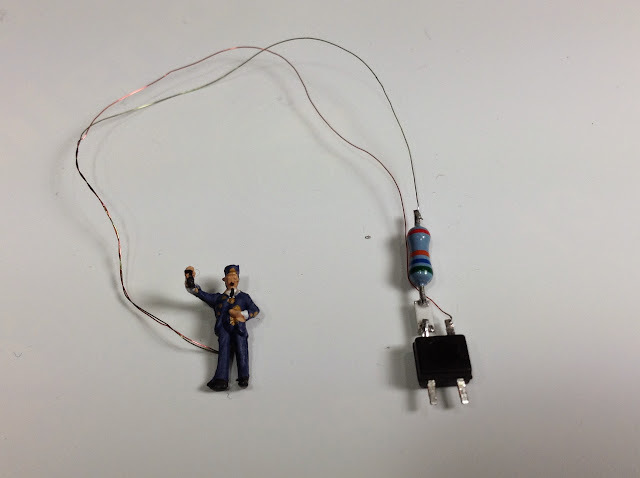 The parts list in this post has a really small bridge rectifier robust enough for a typical N scale lighting strip. If you continue reading that thread, on subsequent page, Craig has posted a photo showing how small the circuit it. voltage and current ratings should be equal or greater than the expected surge value ..
I’ve used the circuit,with self adhesive LED strips, on several dome cars. It’s not a terribly realistic lighting effect, especially if looking at track level. Even with a massive resistor there is a lot of light and they are about an inch apart so you get hot spots. But it worked. I also used it in my VIA park car with two different values of current limiting resistors for the drum head and marker lights. It works well, it’s cheap, and it’s easy to build. 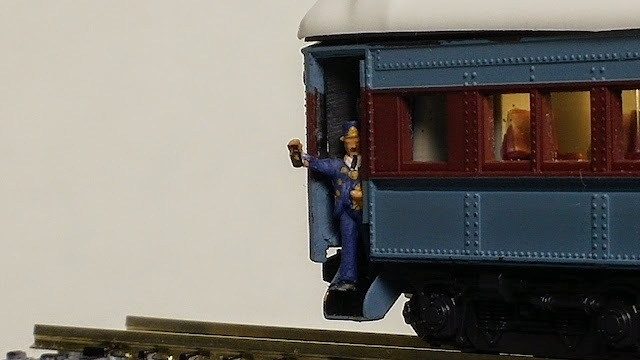 I’ll see if I can find some time in the next couple of days to set up a dome car and a coach, and take some photos. How about using a strip of 0.005" white styrene, creased in the middle and bent into a shallow "V" shape places over the LED strip? Or a similar type of translucent (but not transparent) material? That should act as a diffuser for the light from LEDs. You might actually have to make the LEDs a bit brighter to compensate for some of the light absorbed by the diffuser. The important thing (and why the "V" shape is that the diffuser has to be away from the surface of the LED to better diffuse the light. Ore even better, create a fake ceiling using a flat piece of diffusing material glued inside, at the bottom edge of the roof? That’s a very good idea that I never considered. The coaches are fine. But the domes with all of that glass would definitely be improved. You really don't want the dome lights to be very bright, anyway. The whole idea of the dome is to have people be able to see the scenery. When I was in B&O and NP dome cars, they were dimly lighted. B&O had search lights mounted outside on the roof for a while, but those bothered the neighbors. This might be making something out of nothing, but... "massive resistor" ? You do mean a high resistance value, in ohms, right? A physically large resistor won't make the slightest bit of difference and for LEDs, you wouldn't need anything more than 1/8th watt (and probably not even that). But you should be able to use a 15k or 22k ohm, something in that ballpark, to get SMD LEDs to really dim way down. Hot spots, I gett it. But it's not clear to me why it was hard to keep them from putting out too much light. Yeah, he meant high value resistor. If you look at the other thread he is already using a 15k resistor (white LEDs are very efficient). And the hot-spots will be present (since LEDs are point-sources of light) unless he installs some sort of a diffuser (also mentioned here earlier). Actually I just thought of another way to diffuse light. Paint the inside of the roof (arched ceiling) flat white and suspend the LED strip in the center of the roof, with the LEDs facing up towards the ceiling. That way the light will bounce off the ceiling and shine through the open area between the edges of the strip and edges of the ceiling. My experience with lights that shine upwards inside coach roofs is that they tend to make visible light come through those roofs in a darkened room. I had to clad the ceilings with tin foil to stop that, then paint the tin foil to keep the reflected light from being too harsh. After thinking about that, I probably should have just used white paper under the foil, because that is easier. Yes, any (preferable satin or flat) white surface works really well (much better than silver or mirrored surface). And of course, steps have to be taken to prevent the light from being visible through the roof's plastic. Same goes for other walls of the car (depending on how opaque the plastic is).